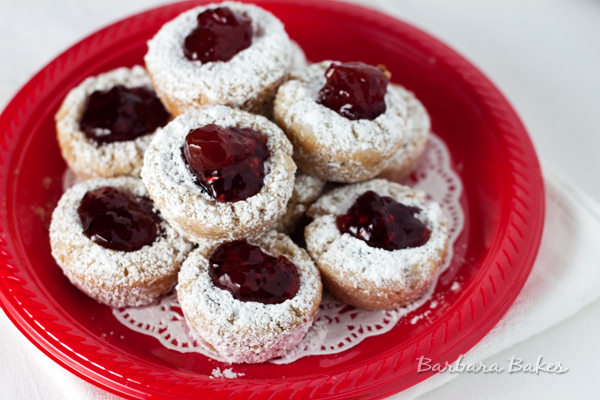 A lightly sweet, buttery, sandy, pecan cookie sprinkled with powdered sugar and filled with a dollop of jam. If you like pecan sandies, I think you’ll like this cookie even more. I was invited to participate in a fun holiday baking campaign featuring some of my favorite brands. The brands (Smucker’s®, Pillsbury®, Folgers®, Hungry Jack®, Jif®, Eagle Brand®, Crisco®) have created a site that allows visitors to view holiday cookie and dessert recipes using their products and create their own holiday baking pin board. There are three recipe categories, classic cookies, new cookies, and other desserts perfect for the holidays. I’m always up for trying a new cookie recipe, so I chose one from the new cookies category, Jam Filled Pecan Snowball Cookies. My husband is a huge Smucker’s Strawberry Jam lover and we always have it on hand. We also had Smucker’s Orange Marmalade and Cherry Preserves in the fridge, so I decided to fill the cookies with all three. If you’re a long time reader, you know I’m a little bit obsessed with the cookie cup, so I couldn’t resist baking the cookies in a mini muffin tin. I’ve adapted the recipe below with the directions for making cookies cups. I forgot to sprinkle the powdered sugar on the cookies before filling them with jam, so I had to top them with a little extra jam, which can never be a bad thing. 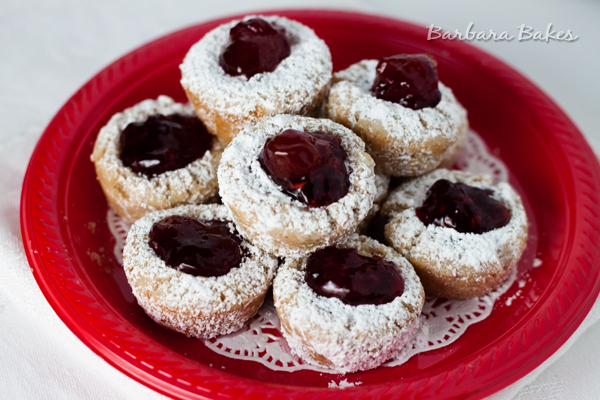 Even though my husband is a strawberry jam lover, he liked the cookies with the Smucker’s Cherry Preserves the best. I think we all did. Heat oven to 350°F. Place pecans, 1/2 cup powdered sugar and salt in food processor fitted with metal blade. Pulse machine on and off to break up nuts, then process until nuts are finely ground. Add butter a few pieces at a time, pulsing on and off to incorporate, then process until mixture is smooth; pulse in vanilla. Add flour and pulse machine on and off until incorporated, scraping the dough down once or twice. Process until the dough begins to form a ball. Drop one tablespoon dough (I used a #50 scoop) into each cup of a greased mini muffin tin. Using the end of a thick-handled wooden spoon make a small, deep well in the center of each cookie. Bake 13 to 15 minutes or until light golden brown on the bottoms and around the edges. 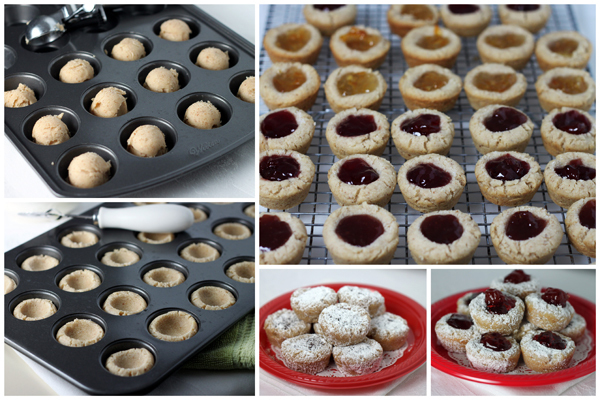 Let cook in pan for 5 minutes then remove to cooling racks; sift remaining 1 1/2 cups powdered sugar over warm cookies. Immediately fill the indentations with jelly and allow to cool completely. *To toast pecans Place pecans in dry nonstick skillet; cook over medium heat, shaking pan until nuts are lightly browned. Cookies may be stored at room temperature in an airtight container for up to 2 weeks; these are best stored in single layers separated by waxed or parchment paper. Disclosure: This post is sponsored by Lunchbox marketing, but all opinions expressed are always my own. 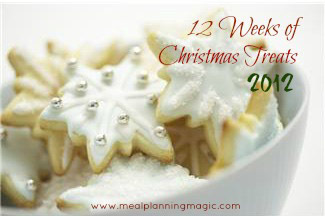 Today’s post is also week 10 of my 12 Weeks of Christmas Treats hosted by Brenda, Meal Planning Magic. Be sure and check out all of the fabulous treats the other 12 weeks of Christmas Treats bakers baked up for this week. These cookies are like Mexican wedding cookies taken to another level with the jam:) Wow, so yummy! I love that these are thick and can hold a good amount of jam. Love these! Great holiday cookie recipe- and so pretty for an exchange too! I was just thinking of snowball cookies the other day, but you’ve done them so much better than I would have. Great idea to pair them with jam! A wonderful and festive cookie, Barbara! What a great way to enjoy your favorite flavor of jam. Slurp…such luscious cookies. Yummm… I’m in the mood already. Have a great day, Barbara. These are one of our family favorites! !